The Humble Bundle this week is Rock, Paper, Shotgun!, featuring World of Goo, Armageddon Empires, and more! For Games with Gold, Xbox One has Super Time Force and still has Crimson Dragon. You can read my ryview of Crimson Dragon here. For the Xbox 360, the new Game with Gold is Monaco: What's Yours Is Mine. Look out for a Ryview of that next week. Later in the month, Halo: Reach is coming to Games with Gold! The Deals with Gold this week feature a lot of Activision games on Xbox 360, as well as Child of Light and LocoCycle on Xbox One. Minecraft finally comes out for the Xbox One on Friday! You can read my ryview of the Xbox 360 edition here! Infinity Blade III is down to $2.99 on iOS today. I've never ryviewed it, but you can read my ryview of Infinity Blade II here. 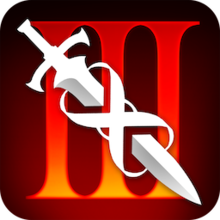 III is very similar, and if you're a fan of the earlier entries, it expands and improves pretty much ever facet of the game.